Our nation, and the world depend on exploratory oil drilling and retrieval operations to fire the furnace of the world economy. We know, as history has shown, that it is not an entirely risk free process. When the worst case scenarios occur, and they are bound to happen, Chemprene has been there with durable, UV resistant products, engineered to protect the planet’s shorelines and offer mitigation tools for the worst possible cases of environmental pollution. Chemprene enables clean-up efforts by providing carcass materials to support the most environmentally friendly response technique. 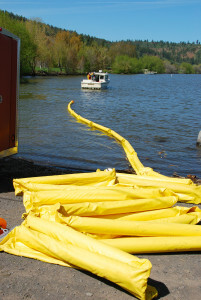 Utilizing containment barriers to isolate spills for clean-up is a growing demand due to the rise in oil exploration in the U.S. and abroad. A well designed boom is the only thing between our treasured eco-systems that inhabit the coastlines and potential calamity. We work closely with converters to meet the required specifications of the Navy and other parties responsible for keeping our shorelines safe and free from contamination.